Happy Friday! Here are two quick deals for some free points and miles. 1. 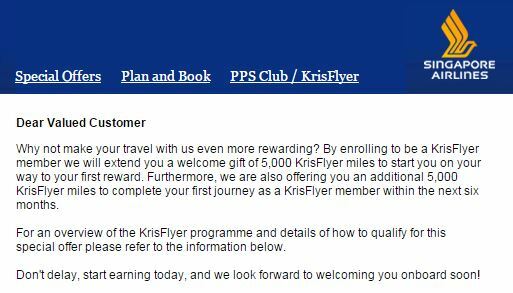 5,000 Singapore KrisFlyer Miles – This is only applicable to new members who register for a Singapore frequent flyer account with an Australian address. You can register at this link and use promo code KFACQPU. Singapore is transfer partner of all 4 major programs (Chase, Amex, SPG and Citi), they have some great award options such as 35k (economy) and 60k (business) miles roundtrip to Hawaii and the KrisFlyer program is really the only option if you want to fly Singapore First Class Suites. While this is obviously intended to Australians, people have reported success signing up with all their information but using an Austrlian address (a random address generator can help here). Obviously do what you feel comfortable with but if you tried to take advantage of the United mistake fare and used Denmark as your home country for billing purposes, I don’t see how this is much different. Most of us in the travel hacking game already have Singapore accounts but for those down under or the adventurous type without an account, this is an offer worth signing up for. 2) 1,000 Club Carlson Points – Club Carlson is offering members 1,000 Club Carlson points for following Club Carlson on Twitter. To earn your free points, register here and follow @ClubCarlson on Twitter – it’s that simple! 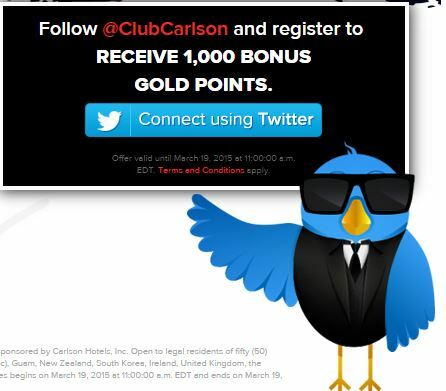 Club Carlson is doing this as a way to promote their #HashtagHotelPromo which is on March 19th when the Club Carlson Twitter account will go private (only allowing followers to see tweets) and they will tweet giveaways along with some free points.